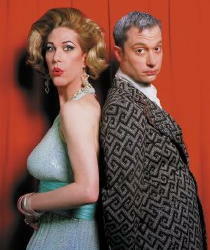 Downtown at the Cherry Lane Theater (38 Commerce Street) singer, writer, actor, and entertainer Justin Bond stars with Kenny Mellman in an off-Broadway play called “Kiki & Herb; Coup de Theatre.” It makes you laugh, cry and think. Justin Bond and Kenny Mellman are brilliant, playing a lounge act duo well into their senior years that reminisce about their 15-minutes of fame. They pal’d around with Princess Grace, and then struggled with a career that never met their expectations. Theirs was a life of hard knocks, starting in the “institution,” where they met. Kiki stands in her spiked heels and sequined dress dispensing knowledge, anger & humility in this 90-minute production, which through story monologues and song deals with everything including fame, children, love, hate and politics. Politically correct? Please! Kiki has had a hard life and she’s not shy to tell you about it. Maybe she’s too tired to worry about it or too drunk to care – but either way, she just tells it like it is. 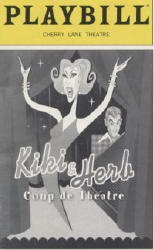 “Herb wasn’t just retarded, he was a gay jew-tard”, she explains, “in an era before it was trendy.” And just as Justin’s (Kiki’s) low baritone voice contradicts, yet blends so well with the feminine presentation of Kiki, so too does the substance of the show find a winning combination of laughter and sorrow blended with irony. “I’m going to liberate you ladies and gentleman – whether you like it or not,” Kiki warns us in the opening minutes, and proceeds to do just that – and you may never be quite the same. sounds so much better than high yella, don’t ya think?” she says with motherly pride), who lives with her adopted parents – are all of course as fictional as the record albums with titles like, “Kiki & Herb, the comeback years.” adorning the entrance wall to the theater. Yet Justin and Kenny make you believe. As she races up and down the aisles frantically looking for her daughter “Miss D,” who is supposed to be in attendance for the first time, your heart goes out to her. Finding seat 17-B she abruptly looks at the gentleman sitting there and demands to know, “what the hell have you done with Miss D, what are you doing in her seat?” only to slowly come to the realization that Miss D was never really going to be there at all. A member of the audience said it best, “Kiki touches upon a little bit of the dysfunction in all of us,” which may be why she is so endearing. Kiki & Herb has no special effects, just a piano against a black backdrop, a blue and pink neon sign and a lot of depth. The standing ovation they received that night echoes my sentiment and I strongly recommend that you skip 5 movies and see this show. UPDATE: in 2007 Kiki & Herb: Alive on Broadwaywas nominated for a Tony Award.